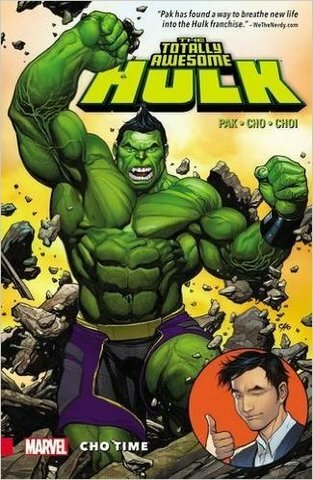 Totally Awesome Hulk Vol. 1: Cho TIme - купить по выгодной цене | Магазин комиксов "Двадцать восьмой"
There's a brand-new Hulk in town, and his name is Amadeus Cho! Get ready for gamma-fueled entertainment as the kid genius decides he's gonna be the best Hulk ever -and just possibly brings the entire world crashing down into chaos! Cho is taking on the biggest monsters in the Marvel Universe, but can he handle the danger posed by Lady Hellbender? What will She-Hulk and Spider-Man make of this very different Green Goliath? And what exactly happened to Bruce Banner? With monster mayhem in the Mighty Marvel Manner, all from the wild and crazy minds of Planet Hulk writer Greg Pak and superstar artist Frank Cho, this is better than incredible, it's totally awesome! Plus: Amazing Science during Secret Wars featuring the Amadeus Cho of Battleworld!